Alisher Saipov, an ethnic Uzbek journalist who was a correspondent for the Voice of America (VOA) and contributor to Radio Free Europe/Radio Liberty (RFE/RL), was shot to death in broad daylight on October 24, 2007, while waiting for a taxi with a friend outside his office. 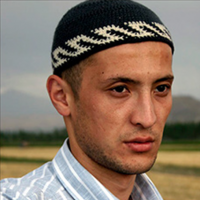 He was killed in his hometown of Osh, Kyrgyzstan, which lies in a heavily ethnic-Uzbek region from which he frequently wrote articles critical of the Uzbek government. He was 26 years old. According to news reports, an unidentified gunman stepped out of the shadows, shot him in the leg and then fired at his head after he had fallen to the ground. In the weeks before his death, Saipov had believed he was being trailed by Uzbek security services and stated that he had heard a rumor that Uzbek officials had placed a bounty on his head. Among other topics, Saipov covered corruption in the top echelons of Uzbek society and the rights violations of Muslims in the Ferghana Valley. He frequently interviewed members of banned religious groups like the Islamic Movement of Uzbekistan and Hizb ut-Tahrir. Saipov also criticized the growing cooperation between the Uzbek and Kyrgyz governments and wrote that Uzbek intelligence officers were operating freely in southern Kyrgyzstan. Officials in Uzbekistan launched a smear campaign against Saipov long before his brutal murder. Uzbek television produced a documentary that depicted him as an extremist and accused him of accepting payment from abroad in exchange for “slandering” the Uzbek government. The propaganda onslaught continued after Saipov’s death. Shortly before his death, in February 2007, Saipov started a pan-regional Uzbek-language newspaper, Siyosat, which translates to “Politics.” Launched with an initial print run of 1,000 copies, Saipov smuggled Siyosat across the border into Uzbekistan. Saipov had been printing 5,000 copies of the newspaper at the time of his death, thanks in large measure to its growing popularity among residents of southern Kyrgyzstan who could read Uzbek. Saipov previously contributed to a Moscow-based website that focuses on news from Central Asia, Ferghana.ru. He also contributed to RFE/RL’s Uzbek Service, the Voice of America’s Uzbek Service, and the BBC World Service. Saipov was survived by his wife and a three-month-old daughter, Zulayho, as well as his father, mother and four younger brothers. Over the next year-and-a-half, Kyrgyz investigators conducted a contentious and often passive investigation which was criticized by Saipov’s family, colleagues and supporters. Kyrgyzstan claimed to be looking into allegations that Uzbek security agents may have responsible for Saipov’s murder. A separate NGO backed the claim by stating there were “strong indications” to support it. Then Kyrgyz President Kurmanbek Bakiyev pledged to take personal control over the investigation and make sure it would be brought to a quick and successful conclusion. In early April 2009, officials announced that they had found the murder weapon. They also stated they had detained former police officer Abdufarit Rasulov for drug trafficking and subsequently discovered the pistol used to shoot Saipov which they confirmed with ballistic tests. Rasulov was charged with murder though he claimed the pistol had been given to him the previous December by a man identified only as Sharakhmatullaev. Later that October, Kyrgyzstan’s Interior Ministry announced that the second suspect was being sought. An Osh City Court trial judge ruled that there was insufficient evidence for the murder trial against Rasulov. Avaz Saipov, the journalist’s father, initiated an appeal hoping that his son’s murder would be reinvestigated by a different court. The Kyrgyzstan Supreme Court ruled on December 9, 2009, that the prosecution of the suspect could proceed and sent the case back to the Osh City Court for further investigation. Rasulov’s lawyer maintained that his confession to any involvement in the crime was done under duress and torture. The Osh City Court ruled on January 26, 2010, that Saipov’s case would not be the subject of an additional investigation. Around the same time, contradicting statements about the arrest of the second suspect in Tajikistan were being reported by the Kyrgyz Interior Minister and Tajik officials. Rasulov was tried and found guilty of murdering Saipov later in 2010 and sentenced to 20 years in prison despite the protestations of Saipov’s family who believed that the real killers and those who plotted the murder had not been punished. In October 2012, Kyrgyz Deputy Interior Minister Melis Turganbaev confirmed to RFE/RL that a new investigation had been launched into the high-profile murder. Turganbaev did not elaborate, only saying that a fresh investigation was underway and referencing “new leads.” The new investigation has not identified any new suspects involved in the killing. On the 10th anniversary of his death, a commemoration took place in Saipov’s house, which has been transformed into a museum, in his native city of Osh. The celebration of his life also included a special edition of Siyosat and the publication of a book. One of Saipov’s brothers, journalist Shahrukh Saipov, said there were also plans to establish a prize in his name soon to honor young Kyrgyz journalists. The award was announced five days after the murder of Alisher Saipov and formally established on April 24, 2008.